French sculptor, engraver, publisher and cartographer. Native of Franch-Comté, followed his elder brother, Pierre Simon to Paris in 1657. From 1664 he was student at the St. Lucas Academy. In 1665 he was created Sculpteur du Roi & in 1678, Sculpteur & Geographe ordinaire du Roi, official geographer to King Louis XIV. Married twice, firstly Jeanne, daughter of Parisian publisher and mapseller, Nicolas Berey, in 1664, by whom he had seven children. She died 1676 and Jaillot succeeded to the stock of his father-in-law. He remarried the same year Charlotte Orbane, daughter of a rich parfumier, by whom he had a further 8 children. Worked closely with the heirs of Nicolas Sanson, Guillaume & Adrien Sanson, in the late 1660's and early 1670's. 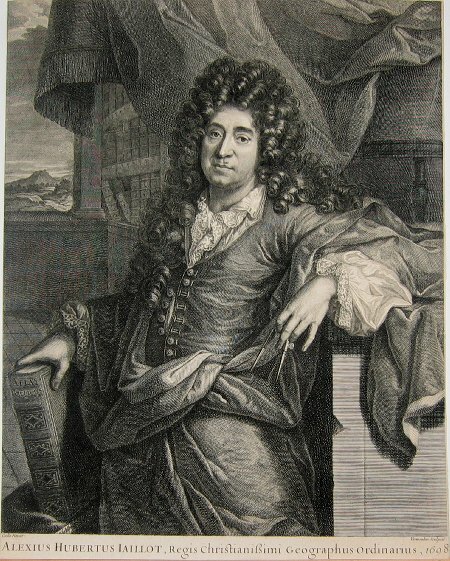 His most famous works include the Atlas Nouveau, first published in 1674 (reissued in numerous editions, including Dutch editions by Mortier and Covens and Mortier) and Neptune François  and Atlas Français . He also reissued the series of 4 Willem Blaeu Continental Wall maps in about 1669 with French border texts. The family remained closely involved in cartography, Alexis Hubert being succeeded by his son, Bernard Jean Hyacinthe Jaillot [1673-1739] and grandson, Bernard Antoine Jaillot [d.1749] and the latter's brother-in-law, Jean Baptiste-Michel Renou de Chauvigné-Jaillot [1710-1780]. At the latter's death, the stock of Jaillot was liquidated in auction in 1781, most being melted down. However a few plates were purchased by the French cartographer Jean-Claude Dezauche, which appeared in his Catalogue of November 1781 and Desnos, who in 1789 reissued the 6-sheet map of Asia by Sanson-Jaillot.